Durham Rescue Mission held its annual back-to-school giveaway Wednesday. DURHAM (WTVD) -- The line wrapped around the block for the Durham Rescue Mission's back-to-school giveaway on Wednesday. Some were even waiting since 3 a.m. for the event that kicked off six hours later. The goal of the back-to-school bash was to prepare Durham school children from families in need with supplies for the new school year. 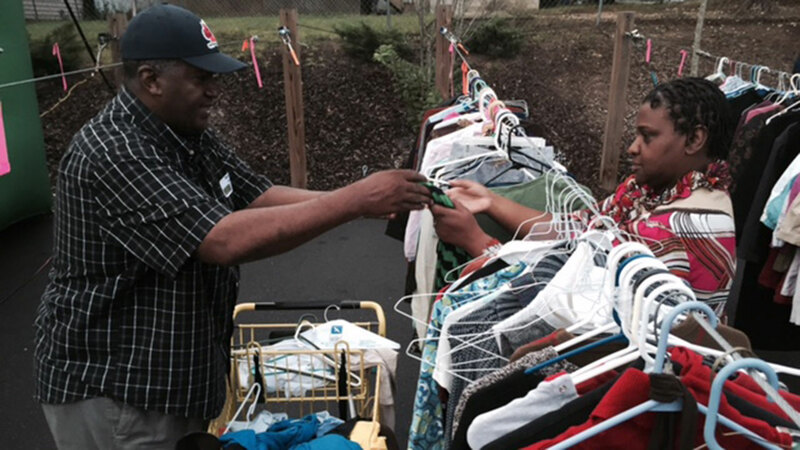 Durham Rescue Mission holds annual back-to-school giveaway Wednesday. Volunteers were at the Durham Rescue Mission early Wednesday morning to get ready for the event. Organizers prepped thousands of backpacks, hot dogs, and donated clothing to give away. Everything was donated by various organizations like GlaxoSmithKline and Crosspointe Church of Cary. "Good health, good education are two key drivers for these young people to achieve their full potential, and we want to be part of that," said Jack Bailey, President of US Pharmaceuticals for GlaxoSmithKline. GSK had 150 volunteers at the event and donated 3,000 of the backpacks. Ernie Mills Jr., Stewardship Officer for the Durham Rescue Mission, said although he had all the supplies he needed when he was growing-up, he could image how left out he would feel if he didn't. "I would be behind on that very first day of school, and sometimes you despair pretty quickly," Mills said. "If you're already behind, if you don't have what you need and now you're trying to beg and borrow and plead, it's just another challenge that they have to overcome." Asia Deas is getting ready to start eighth grade. She said it would be tough to handle the school year if she was less prepared than her peers. "It would be hard because you wouldn't be able to have pencils and notebooks to write in, while like, other kids are writing in it." Asia's father, Ricardo Stephens, said it's difficult to afford all the supplies his daughter needs. "It's very tough. It's very hard, so that's why we out here. Thank the Durham Rescue Mission for all these very important things that they're doing for us," Stephens said.